Last week, my teammate stopped by and told me that he was going to be studying the Middle East and the politics of oil in his social studies class. Would I want to do anything about oil? Well, we have already "covered" the environment in September, and we were currently studying plants, but I figured dead plants make up fossil fuels. Close enough. That night, at home, I was scrolling through the Chicago Tribune, when I came across Mayor Daley and Chicago's timely response to recent reports (BBC, CNN) that humans are mainly responsible for global warming. 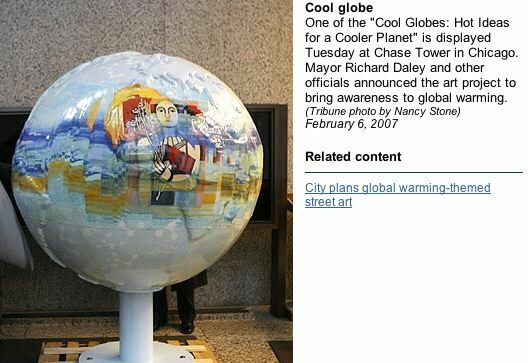 Mayor Daley announced his plans on February 6 and plans to call the exhibit "Cool Globes: Hot Ideas for a Cooler Planet." Now, here's the even cooler part. After the globes hang out at the lakefront for the summer, they will be auctioned off. The money raised from the auction will be used to expand environmental programs and conservation clubs in the Chicago public schools. Now, that is a great way to give back to schools and empower our kids. "We want to help children make the transition from consumers to committed, passionate citizens"
Now this is a story that impresses me. So often, I feel as though I am fighting a losing moral battle with my middle school students. While I strive to model emotional intelligence and remain a pillar of good character in my classroom, the kids are constantly bombarded with mixed messages outside the classroom. Inside the classroom, there are posters telling them that a measure of character is how they act when no one is watching. 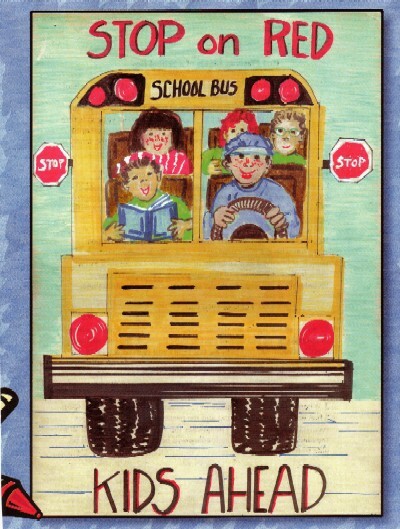 However, outside the classroom, it is often expressed (even by parents) that "it's OK as long as you don't get caught." We've been talking a lot about commitment in my classroom lately. In the beginning of the year, we decided to recycle the aluminum cans at our school. After much research and negotiation with the principal, I stood in front of my kids and took a "heads-down, hands-up" vote of whether we should take on this responsibility. I strongly reinforced that this commitment would require going outside twice a week for about 20 minutes to sort through the garbage and crush the cans, for the entire year. This would include the midwest winter months, which are brutal at best. All but one of my students made a promise that they would commit to our goal. Now, in February, the whining is at its peak. "Do we have to?" "But it's cold!" "This is stupid." I remind them that they made a commitment. I tell them to bring a hat and gloves. (Which, in middle school, is decidedly 'uncool.') We agreed that this was important, and that this mattered to the environment. And I will not let them back out of their agreement, as they are allowed to do so often in their lives. Some kids are starting to get it. When it is below freezing outside, I do give the kids a choice. (I'm not that crazy.) Lately, some kids have been saying "We made a commitment - I'm in!" I read about pillars of character, and believe kids should be encouraged to embrace these ideals. But, there's part of me that wonders... how many adults do I know who embrace these characteristics? Sometimes, I get discouraged with society. But, once in a while, I am reminded by people such as Richard Knoebel that good character still exists. Nice work!